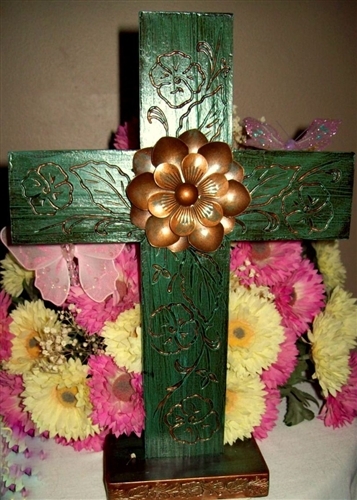 This very beautiful, substantial cross is made of hand cast metal. Etched with flowers and painted green (with gold accenting the crevices) using a dye cast process to give it a slightly imperfect, almost rustic look to make it unique. With a gorgeous gold "prairie rose" accenting the front, this cross stands an impressive 11.5" high, by 8" wide and can either be hanged or displayed on stand. 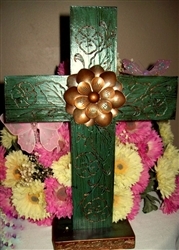 Each cross comes ready to hang or display, complete with hanger (on back) and stand, included. Makes a great gift for any occasion, such as Christmas, Easter, Communion, Sympathy gift - or simply to display one's faith.